SE Radio is looking for a volunteer host to produce five episodes per year. No previous podcast experience is necessary – we provide training and coaching. A broad interest in a range of topics, some work experience developing software, and an interest in communications and broadcasting are all that’s necessary. The host comes up with show ideas, locates guests, and prepares and records the episodes. 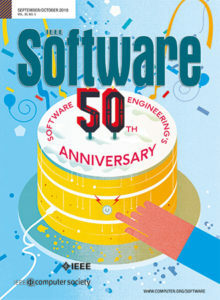 The IEEE Computer Society provides audio editing and publication. This is an opportunity to interact with and learn from our international community of podcast hosts and to talk to the most interesting and innovative people in the industry for an hour at a time. Please contact the show editor Robert Blumen for more details. Also read our volunteer show host manual to get an idea of how we develop shows. I am an Software Engineering academic, founder and researcher. I have been following SE radio for years. Would be interested in being a volunteer host. I’ve been following the Software Engineering Radio podcast for a while and find it very informative, the podcast has provided me with knowledge and professional skills relevant to my job, I’ve worked in the Software industry for 8 years and would love to be part of the podcast and have the opportunity to interact and learn from the community as well as to contribute so others can learn.